And now, for your edutainment: 2015’s second movie about Apple visionary and all-around jerk, Steve Jobs, creatively titled Steve Jobs for sake of ease. 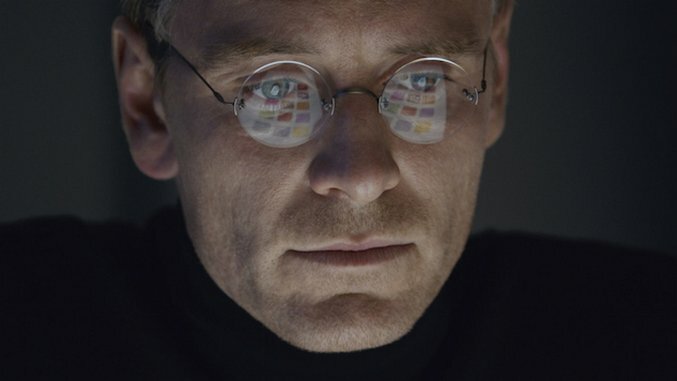 The film marks Danny Boyle as the second person in 2015 to attempt at parsing out the many faces of the late Jobs, or maybe the third. Boyle has the director’s credit, but the heart driving the production is clearly that of screenwriter Aaron Sorkin. Sorkin’s stamp shapes the narrative here so much, in fact, that calling Steve Jobs a collaborative effort feels like a condescending pat on the head to Boyle, whom Sorkin appears to have teamed up with just so he can drive in the carpool lane. It’s a Boyle film where Boyle struggles to be relevant and fails. Both men have unleashed their joint hat tip to Jobs a month after Alex Gibney bored us with Steve Jobs: The Man Inside the Machine, a lazily researched movie for the Wikipedia era of journalism. Steve Jobs, at least, cares enough to show us what we know instead of simply telling us, for whatever that’s worth. You don’t need to have read the damning reports on Jobs’ personal and professional practices, or seen Gibney’s documentary, to know that Jobs was a bad, bad man. The film sidesteps pedantry to erect a portrait of Jobs as a human being, as a genius, as an industry titan, and as the unapologetic schoolyard bully we all had to put up with at one point or another in our childhoods. Structurally, Steve Jobs is an unmitigated success. If the film does anything well, it’s buck biopic conventions through shrewd narrative design: For two hours, it tells a fractured tale across three different periods of Jobs’ career, each of which revolves around a product launch. In 1984, it’s the Macintosh 128K. In 1988, it’s NeXT. In 1998, it’s the iMac, the Bondi blue gumdrop that revolutionized personal computing through the aughts. In each segment, Jobs (played by Michael Fassbender) contends with beseechment from his family as well as his friends and confidants, though for Jobs, “family,” “friends,” and “confidants” are roughly defined as “hangers on,” “distractions,” and “enemies.” To him, the people inhabiting his daily existence are hurdles on his quest to attain vaguely sketched catharsis rooted in his need for a strong father figure. Unlike those projects, Sorkin’s only real interest here appears to Jobs’ legend, or, at least, the parts of his legend that make him legendary. Sure, Jobs was a great inventor, or innovator, or motivator, or whatever he actually was. (As the movie goes out of its way to remind us, he didn’t have any special skills that lent themselves to the coding or engineering side of building computers.) But he was a terrible everything else. That’s partly why Steve Jobs is so appalling: It doesn’t care that Jobs, frankly, sucked. The film mitigates his cruelty with one-liners and by having Fassbender throw around made-up words like “absofruitly.” Ultimately, it’s hard to say what the film does care about, other than Jobs’ greatness. When Steve Jobs offers critique on his morals and ethics, it reads like a token gesture, because no mainstream studio biopic about a figure like Jobs can reasonably get away with not confronting his worst tendencies and transgressions. But when the film focuses on his desire to achieve, we can sense Sorkin’s admiration for Jobs behind the camera. We can feel just how highly Sorkin thinks of his subject. Yes, there are aspects of Jobs that are admirable and inspiring, and yes, it’s possible to separate Jobs the industrialist from Jobs the crappy colleague/crappier dad/even crappier husband. But Steve Jobs makes a half-assed effort at separation and instead indulges in fanboy fawning. Whether he’s putting off his peers, cutting them down with a Sorkinesque barb, or trying his best to pretend they don’t exist, Jobs is portrayed as the hero of the piece. At least Boyle, who cannot at all grasp how to frame a shot or tell a story without treating his viewers like imbeciles, and Sorkin knew well enough to hire great actors to play out their technobabble update on A Christmas Carol. But Boyle is too hopeless a craftsman to honor Sorkin’s dialogue, and Sorkin is too in love with Jobs to say anything worth listening to.